Smart Trainings are meant to help you, to work on your deficits and to get you to your individual, optimal form. Everything begins with the Training Meter, which consists of three phases; your aerobic threshold, your VO2max and your anaerobic threshold. The aerobic threshold explains the duration, for which performance can be done. Meant is the endurance load. VO2max ist the maximal amount of Oxygen, which your body can use. With the aerobic threshold, you can test, how far you can use your potential during endurance activities. There's three forms in which you can come across a 2PEAK Smart Training. They can appear in your trainings plan, which would look like the picture below. This happens, when 2PEAK has found a deficit somewhere in the three phases mentioned above. The training is then recommended by 2PEAK, so that you can work on that deficit. By scrolling over the "circles", you can see and read further details about your Smart Training. You can decide whether or not, you chose to do a Smart Training. Of course it'll be harder compared to your regular training session, but only by working on your weaknesses, can you get better. 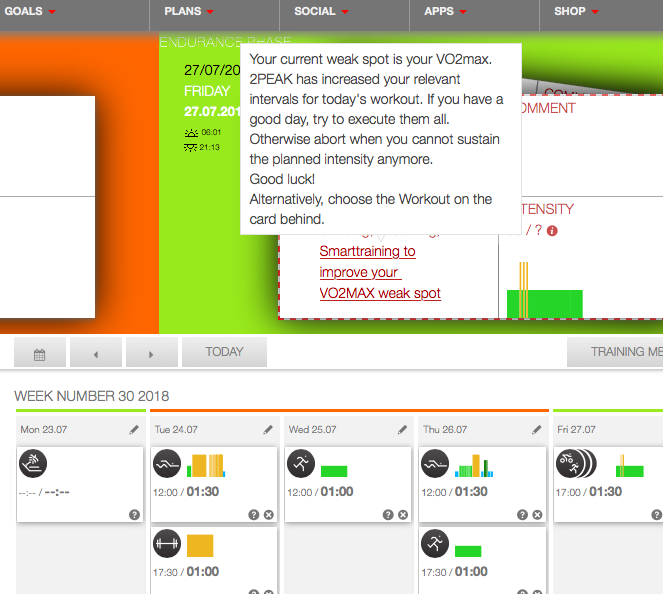 When you click on the red text underneath your Smart Trainings, above your trainings plan, you will receive all important information about your Smart Training. The second form, in which you might meet a Smart Training, is, when 2PEAK recommends you, to do a performance test, to check your numbers, such as your heart rate, etc. to adapt and update anything, if it has changed. The idea and technology behind it, are the same as the ones with the recommended Smart Trainings in your trainings plan (mentioned above). Lastly, the workings of our Smart Trainings can also be discovered, when for example, you want to do a long jog, the day before your race or a long bike ride and 2PEAK dissuades you from doing that, by putting a "race warm-up training" into your plan. This training is individually made for you, so that your body is as ready for the next day (race day) as you want it to be. The smart thing about Smart Trainings is, that depending on what sport and distance you chose, they make you specific and individual recommendations, to work on your deficits.